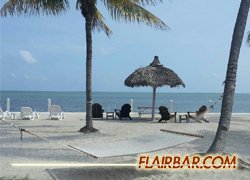 For 17 years, as the sun rises over the serene Florida Keys following a peaceful Mothers’ Day, bartenders, servers, and other hospitality industry workers alike descend southbound upon Islamorada for what is a genuinely unique event that exists unrivaled: Bartender’s Bash. Home to one of the longest running Flair bartending competitions, a world famous bikini contest, product demos from countless brands, a relaxing (and frequently debaucherous) few days of partying by all, and in recent years a wholly unique mixology competition. For the past 7 years, the competition series expanded to include the famed End of Season Party at the Bahia Cabana Beach Resort in Fort Lauderdale the following month, maintaining the high level of talent (and debauchery) across the board. We can certainly say beyond a shadow of a doubt that this year’s competition series held firmly to the high bar set by the Bartenders’ Bash of yesteryear in all those facets. If there was any single noticeable trend this year in both Pro & Rookie Divisions it was NEW FACES!!! 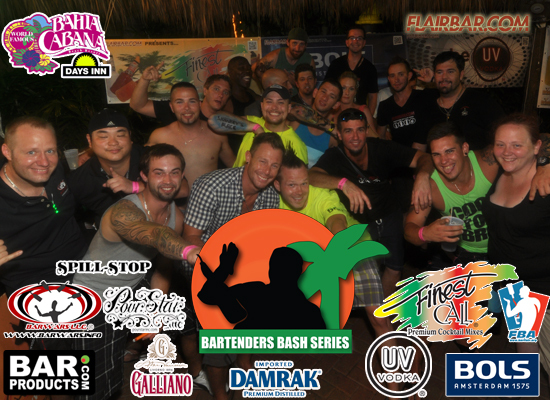 Flairbar.com was proud to welcome a number of bartenders from across the country to tradition of Bartender’s Bash such as the amazing crew from BAR CHARLOTTE, Several Team Members and alumni from the new Flair Hard Program in Miami, as well as the man who has taken the FBA and the world by storm this year, Colby “Cheese” Ashton! Of course, we had many friendly veterans ready to welcome them appropriately, with outstanding rounds from world class competitors such as Dario Doimo & Rodrigo Delpech, the bar was certainly set high. Holding true to form, the Bartender’s Bash Series presented one of its most daunting challenges to the competitors: The Blind Flair Competition. With a multitude of Flair competitions in North America and around the world that pit bartenders against each other in a battle of meticulously planned, exhaustingly rehearsed, and delicately choreographed routines executed to near perfection, competitors in the Bartender’s Bash Series instead learn their drink list, time limit, and sponsors only in the pre-competition meeting, minutes before the kickoff of the competition. This dynamic obstacle demonstrates a Flair bartender’s capacity to adapt his style of Flair to the situation presented and requires a thoroughly well rounded skillset. Moreover this year at both stops of the series (Postcard Inn, Islamorada and Bahia Cabana, Fort Lauderdale) competitors found themselves onstage in front of a fun and energetic audience. In Islamorada, competitors found themselves facing two curveballs : primarily, the uniquely shaped sponsor product, Karlsson’s Vodka with its unique potato themed packaging, presented ergonomic difficulties for several competitors, while others adapted familiar very advanced moves (Yeah, Dario, I’m talking about you) effortlessly to present Karlsson’s with an unparalleled level of difficulty. Moreover, competitors faced the added difficulty of a brief four minute routine on stage to present the sponsor cocktails, wow the judges, and ignite the crowd. After all was said & done in Islamorada, Dario Doimo claimed the title of Champion on the Flair Stage. In Fort Lauderdale the same obstacle of a “Blind Competition” presented itself in a manner that demanded the utmost of dexterity and ability. Competitors found themselves facing some very familiar sponsor bottle shapes, such as UV Vodka & Bols Liqueurs, and a new bottle from Damrak Gin that were all very Flair friendly. Subsequently we saw competitors attempting (and landing) complex 4, 5, and 6 object moves with these bottles that astonished the rain drenched and still rockin’ Fort Lauderdale crowd. An additional challenge was presented in Fort Lauderdale though, a challenge that many Flair bartenders have discussed at a bar after a competition or shift with other bartenders, but few Flair bartenders ever actually attempt: The Galliano 750ml . This towering bottle was delicately manipulated in each of the routines onstage in Fort Lauderdale and the crowd was certainly privy to some unique moves from the competitors. Following an intense battle in the pro division, the legend himself, Rodrigo “Rodo” Depech sponsored by Barproducts.com dominated the Flair competition and Todd Bayley of Bar Charlotte, North Carolina sealed his first place finish in the series capturing his second title of “Best Rookie” in the series. 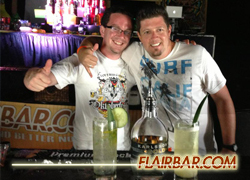 The 2013 Bartender’s Bash Series also incorporated a new element in the prize structure using social media to decide the Flairbar.com “Crowd Favorite”. Though there were hundreds of votes cast for our many competitors, Colby Ashton dominated this category in both Islamorada & Fort Lauderdale taking a commanding first place at both competitions. In it’s 5th year, the, “86’d” Mixology competition rounded out the skills that competitors in the Bartender’s Bash Series had to bring to the table by pitting them against each other in one of the toughest mixology competition formats that can be found. The qualifying rounds allowed competitors to, “bring the kitchen sink” using homemade syrups, infusions, carbonations, foams and all sort of creative uses the sponsor products to determine the top four qualifiers in Islamorada as well as in Fort Lauderdale. The final round of the, “86’d” Mixology Challenge pitted these top four qualifiers of each competition in a wholly unique format of final round in which they were presented with baskets containing 4 mystery ingredients and ten minutes on the clock to produce and name four cocktails highlighting the sponsor product. The ingredients competitors found in these baskets varied widely from exotic fruits and spices such as Pepino Melons & Ghost Pepper salt to very common items that one might never consider incorporating into a cocktail, like hibiscus tea, flax oil, & ginger snap candies. The 86’d Mixology Challenge this year featured a collection of bartenders from a wide array of styles and skill levels, some in their first mixology competition with years of Flair experience, along with some seasoned cocktail competition veterans. Following heated finals (both literally & figuratively) in Islamorada, the Final Round of the Mixology competition came down to a Mentor/Apprentice battle between myself (Danny Seigel) and the man, the myth, and the Flair & mixology legend himself (and someone I’m proud to call a mentor) Cesar Romero. Following a close final round, Cesar claimed the first place title in one of the closest final rounds to date. In Fort Lauderdale, we saw some of the same faces in the Mixology Finals as in Islamorada, including Colby Ashton who, following his first mixology competition in Islamorada, made an impressive vie for the mixology title in addition to his success in the Flair competition. In the end, Cesar Romero made the clean sweep, winning the the mixology competition and sweeping the series with the highest cumulative score in the mixology competition overall. Following the close of the Fort Lauderdale stop of the Bartender’s Bash Series and the cumulative points tally, the title of Overall Series Champion of the Bartender’s Bash Series was not yet determined as Colby Ashton & Myself had tied dead even in the points series. This led to a tie-breaker round in which we had to demonstrate our abilities as bartenders to promote a product, in the form of a three minute promo video for Finest Call Premium Bar Mixes. After the videos were posted, the judges named Colby the overall 2013 Bartender’s Bash Series Champion! Check out the winning video below promoting Finest Call Premium Bar Mixes. The Bartender’s Bash Series 2013 was everything we have come to know, love, and expect of it. There was intense competition, great times with outstanding friends-some new and some old, and memories that can only be recalled amongst close friends (not in mixed company) were made by all. Though there are many facets of the Bartender’s Bash Series that make it an incredible competition in their own right, the truth of the matter is that the Bartender’s Bash Series is such a unique experience because of the experience It is as a whole; The venue, the competitions, the competitors, the crowds, the amazing sponsors, the friends, the memories, it’s the combination of all these things that truly make the Bartender’s Bash Series such a unique competition. *Author’s Note: If you ever find yourself attending Bartender’s Bash in Islamorada and wake up the last day thinking, “Wow! Nobody in my group made a complete fool of themselves!” Rest assured – it was you who, in fact, made a fool of yourself.